Plenty of great flagship smartphones have been released this year and while we’re definitely looking forward to seeing what 2015 brings, it’s important to also check out the current offerings on the market. One such device is the highly acclaimed Samsung Galaxy S5, which is still holding up remarkably well to this very day. In the same category as the S5 we find Motorola’s latest iteration of their popular flagship which goes by the name of Moto X (2014), or second generation Moto X. These two devices are surprisingly similar despite the fact that one came out several months after the other. 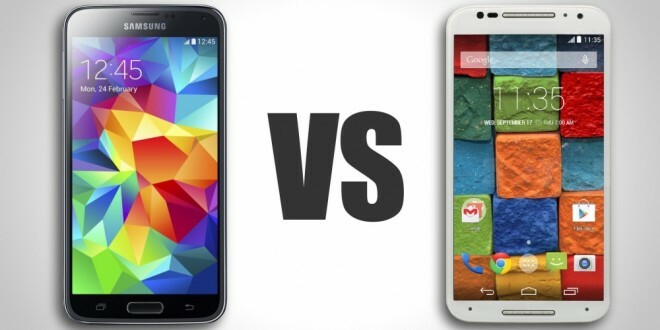 This could make choosing between them quite difficult, but hopefully our brief Moto X (2014) vs Samsung Galaxy S5 comparison will help you if you’re ever uncertain about which one to pick. The design is arguably what sets these two apart the most as they look very different from one another. The Moto X (2014) clearly has an advantage here thanks to its metal frame and customization feature, which allows users to pick between a wide variety of back covers including wood and leather. Meanwhile, the Samsung Galaxy S5 sports and all-plastic body that doesn’t necessarily look cheap, but it certainly doesn’t look (or feel) premium either. As for the display, both flagships come equipped with 1080 x 1920 resolution screens protected by Corning Gorilla Glass 3. A small difference is that the Samsung Galaxy S5 sports a 5.2-inch panel while the Moto X (2014) features a 5.1-inch display. A small difference overall. A more important one is the IP67 certification on the S5, which makes the device water resistant. The Moto X is water resistant as well, but doesn’t feature the mentioned certification. If we were to make a choice between these two based solely on the specs, we would definitely have a very hard time doing it since the differences are pretty small. Both the Samsung Galaxy S5 and the Moto X (2014) come equipped with Qualcomm Snapdragon 801 quad-core processors clocked at 2.5 GHz, Adreno 330 GPUs and 2 GB of RAM. Moreover, the two also come in the same storage configurations, namely 16 GB and 32 GB, although the Samsung Galaxy S5 features a microSD card slot (up to 128GB) as well. The Moto X (2014) doesn’t offer microSD support strangely enough and its 13 MP primary camera is also a few mega pixels behind its rival’s 16MP sensor. Finally, the Samsung Galaxy S5 comes with a bigger 2,800 mAh battery. However, while the Moto X (2014) only has a 2300 mAh battery, the smartphone features fast charging technology. Moreover, Motorola also offers the optional Turbo Charger that helps you recharge your phone in minutes rather than hours. Hardware aside, the operating system is Android 4.4 KitKat out of the box on both handsets, although they can be upgraded to Android Lollipop. Motorola devices usually get Android updates a bit faster but Samsung has also provided them in a timely fashion lately, so don’t expect any major differences when it comes to the OS. It is worth mentioning however that the Samsung Galaxy S5 comes with the rather criticized TouchWiz user interface while the Moto X (2014) has an UI that’s more akin to stock Android. Whether people like it or not, TouchWiz is likely here to stay for a while longer, so make sure you keep that in mind if you plan on choosing based on how the interface looks. Last but certainly not least, we need to mention something about the price. Generally speaking, the Samsung Galaxy S5 goes for anywhere between $600 and $700 unlocked, although you can probably find it a bit cheaper than that if you’re shopping on places like Amazon. Meanwhile, the Moto X (2014) comes with a $400-$450 price tag depending on the version and gets more expensive only if you choose to further customize it with Motorola’s Moto Maker service. All in all, I would say that the Moto X (2014) seems like a better choice here even though its hardware is a bit less powerful than the one offered by the Samsung Galaxy S5. Whether you choose to customize it or not, chances are that the price will still remain lower and that’s a pretty big advantage. The Samsung Galaxy S5 clearly has a lot going on for itself as well but it falls a bit short when compared to the Moto X (2014) if you ask me. The final decision, as always, is up to you.